Apple Watch is Apple’s new muse of innovation, design and technological leadership. The iPhone is no longer the future of Apple. Apple is no longer just about iPhone. “His greatest gift, his (Steve Jobs) greatest expression of appreciation for humanity would not be a single product. It would be Apple itself.” Tim Cook, September 12, 2017. For me, this statement by Tim Cook made during his opening monologue at the 2017 Special Event was the seminal point of the two-hour Special Event at the new Steve Jobs theatre on the new Apple HQ campus. It set the stage for the subtle but ceremonial passing of the torch that followed – Apple Watch is Apple’s new muse of innovation, design and technological leadership. The iPhone is no longer the future of Apple. Apple is no longer just about iPhone. You might be wondering why I think the Apple Watch is now the torchbearer of innovation for Apple going forward. Well, let me explain by using the traditional watch as an analog. Think about precision of the parts and mechanics, and the density of the timekeeping system that is the Rolex watch. Compare that Rolex to a Howard Miller grandfather clock. The constraint profile of the two devices are on different ends of the spectrum. One is intensely space constrained, and the other,… the other can be as large as Big Ben. Over the decades, traditional watchmakers have had to devise innovative new designs and technologies to squeeze hundreds of mechanical components into a tiny device that could collectively deliver the function of accurate timekeeping in an ingeniously engineered system. No small feat. As innovations such as automated self-winding found their way into the wristwatch, watch designers had to stretch the boundaries of mechanical design and engineering to squeeze additional components needed to support these new functions. Apple Watch is the Rolex, which I suppose, makes the iPhone,…. Big Ben? Like the Rolex wristwatch, Apple Watch will drive the edge of engineering and design innovation in consumer electronic devices supplanting the smartphone, which has led the bleeding edge of semiconductor technology and market for the past decade. 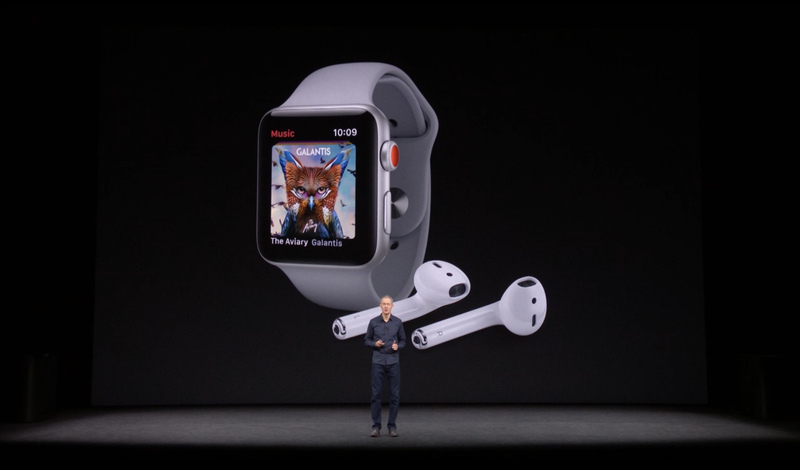 Since its introduction in 2015, we have seen Apple Watch increasingly exert its influence across the Apple product portfolio with features such as Force Touch (a.k.a 3D Touch) and Haptic Engine, which were first introduced in the Series 1 Apple Watch (and MacBook 12”), and are now standard fare across Apple’s portfolio of devices. We can only expect some of the recent innovations presented at the September Special Event, such as the new antennae technology, digital SIM, and the S series chip’s packaging technology to eventually make their way into the iPhone with significant implications and benefit to Apple and its ability to continue its product differentiation and profitability for the next 3 to 5 years. Let’s face it, the smartphone is tapped out. More pixels on a screen is not going to make a difference. Better camera can help, but most premium handsets offer excellent shooters that are more than good enough for most consumers and prosumers. With the latest iPhone X outperforming MacBook Pros in some performance benchmarks, many of the current and soon-to-be released smartphones are overpowered for most applications that folks use. What do most of us use our smartphones for? A little gaming here and there, sharing posts on Facebook, read and writing emails, some web browsing, an occasional navigation session on Google Maps, and texting our friends – not exactly rendering a 1-hour 4K video in ProTools. It is possible that AR and VR applications and onboard AI can push the demand envelop for greater hardware performance and capability. Time will tell, but I have my reservations in the near term. In contrast, the improvement frontier for wearables is expansive and virgin. Case in point, I get about two days on a full charge with moderate use – a workout, dozens of notifications and an occasional navigation session with the map app – from my Series 2 Apple Watch. Yes, significantly more than the 18 hours of battery life cited on the Apple Watch spec sheet, but there is green field opportunity for Apple and other smartwatch vendors to deliver much better performance to support more robust applications such as LTE calls, or using the camera app to remotely compose photos (FYI, major battery hog). So many possibilities, and so much to do. As we saw with the iPhone over the last ten years, performance gains attained through hardware innovations will enable developers to build more robust applications such as the advanced sensor fusion features of the new Apple Watch Health app, which will deepen the value that the Apple Watch can deliver to consumers. More importantly, these hardware innovations will create new opportunities for realizing differentiating hardware design improvements and capabilities across Apple’s device product lines. Is the Apple Watch the next big thing? Probably not, but for the moment Apple Watch will drive the edge of technical and engineering/design innovation at Apple and will eventually drive and enable differentiated capability and performance across all of Apples device products, and ultimately the overall Apple business. I am excited to see what Apple and other vendors like Huawei and Samsung have in store for us as they compete on the new edge of consumer technology. © 2017 neXt Curve. All rights reserved.